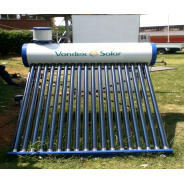 New technology vacuum tube Solar water geyser with a 250litre capacity and has an optional electrical back-up system. The system is extremely efficient and provides non-expensive hot water. The 250litre non-pressure solar geyser comes with 30 heat collectors which are the vacuum tubes, header and storage water tank (250litre capacity) with stainless steel inner, zinc coated outer and 55mm polyurethane insulation, magnesium softening bar and optional extra of electrical element and control box for backup.